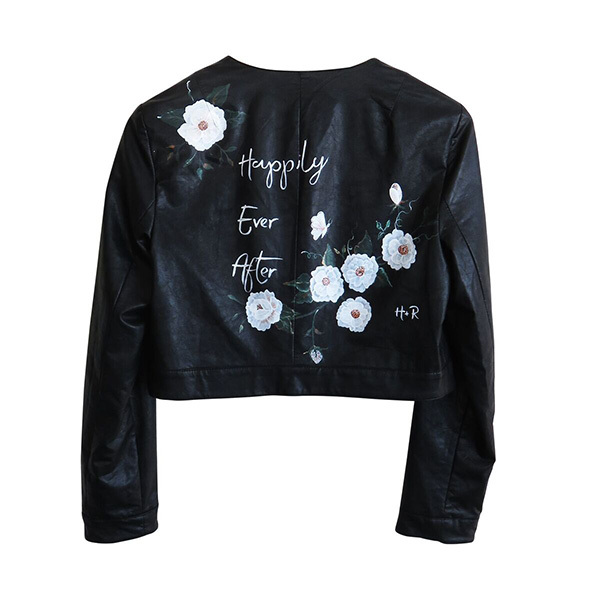 With 6 months of planning under her leather sleeve, Efthimia Devaney, founder of Hide and Rose, now proudly delivers a service that creates special art designs that resonate with the Bride's style on a jacket to be worn for that one special Wedding day and for all the days that follow after that. Hide and Rose launched in August 2017, 3 months after her own Wedding where the idea for providing sentimental, personalised Bridal wear became a business venture for Efthimia. With ready-to-wear designs available to purchase or you can provide your own favourite jacket, be it leather or pleather and choose a design that your heart desires. If you are worried about letting your jacket out of your sight, the satchel you receive from these legends insures it for up to $500.00. Personalising your leather has never been easier or more beautiful. Hide and Rose began after one sentimental Bride’s hunt for an unconventional wedding dress cover-up. I was getting married in May this year (2017) and I wanted to wear something to my wedding that would be warm and reflect my own sense of style – something classic yet edgy, something elegant yet bold. I loved the idea of leather on lace. I searched my wardrobe for something I could re-purpose and found my leather jackets. From then on, I had my heart set on leather but I wanted something feminine and sentimental as well. I wanted to personalise my jacket with roses (Rose being my middle name) and some meaningful words. I wanted to remember that feeling of my wedding day, every time I put on my leather jacket in the future. I worked with an Artist, Ella, to create my wedding jacket. Once my bridesmaids heard, they wanted a personalised and hand-painted jacket too! And so the business adventure began! Hide and Rose officially launched in August 2017 (3 months after my wedding and 6 months after I started to do the planning for the business). The highlight so far has definitely been working with the Artists. I just love who they are, what they are about and their creative talent. The H+R Artists are the essence of Hide and Rose. It has also been kind of cool to have had Hide and Rose painted leather jackets feature in OK Magazine, the Daily Mail and in a styled shoot published by White Magazine. 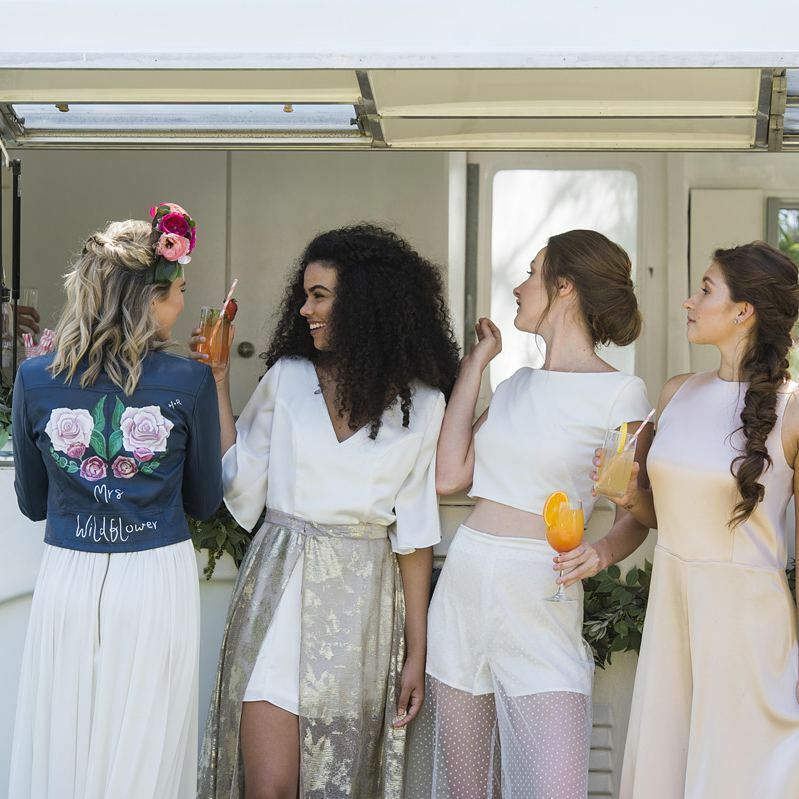 Whether it’s the final detail of a Bride’s Wedding outfit, a layering piece to get from the wedding to the reception or a personalised photo prop, a Hide and Rose jacket is a hand-painted wearable piece of artwork that will be forever enjoyed! 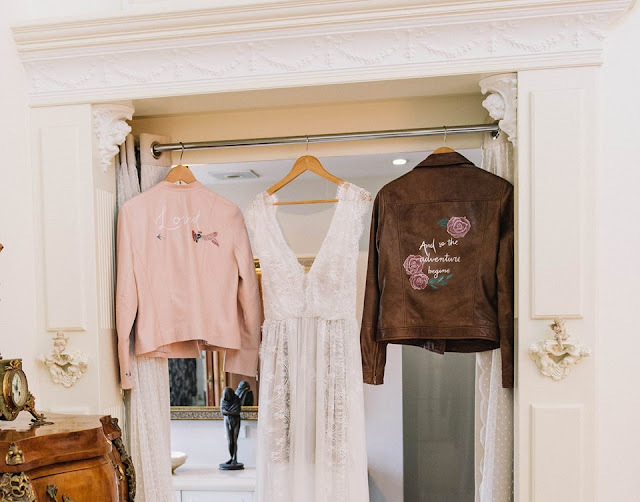 That long-standing tradition of mothers handing down their wedding dresses to their daughters doesn’t happen as much these days, but how beautiful to have a personalised leather wedding jacket, a wearable piece of art, to hand down to your children. I just loved the idea that much I started a business about it! Often we receive orders from Bridesmaids purchasing the gift for the Bride for their bridal shower or hens night. It could be the customer’s favourite genuine leather, faux, vegan or pleather jacket. A jacket re-discovered in the back of their closet, a purpose bought new jacket or a pre-loved jacket. The reason we want the customer to provide the jacket is so that the jacket fits perfectly and is the style of their choice, plus it’s better for the environment! We have artwork examples on our website by 4 different Artists which can be personalised. The customer selects the design and fills in the boxes to personalise the jacket. Within 4 days (for Australian customers) they receive a self-addressed post satchel and they simply place their jacket in the satchel and then drop it into any Australia Post retail store or red Australia Post box. Within 14 days of their jacket arriving, the Artist completes the hand painting and the jacket is posted back to the customer. We also have some great ready-to-wear jackets on the website where customers can purchase the jacket with the artwork ready to go!